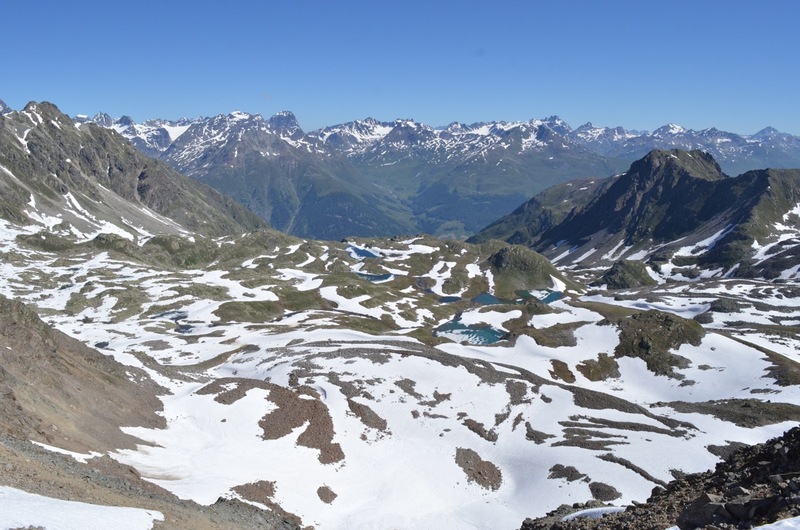 On our cycle tour of rewilding areas in Europe, our third stop was Parc Naziunal Svizzer – the Swiss National Park. Established in 1914, it was the first national park in the Alps and by now one of the oldest national parks in Europe. It is one of the first members of the European Rewilding Network (ERN). Breath taking views of the Macun cirque at Swiss National Park. To get to the Swiss National Park on the bicycles, we had to do a lot of riding uphill! 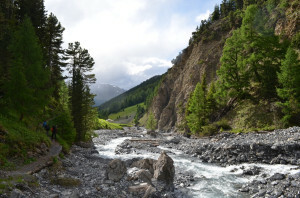 However, once we had tackled the switchbacks of the Maloja Pass to St. Moritz, our reward was a gentle ride along the valley to Zernez, where we would be staying for the week. We pitched up at the Zernez campsite and emailed our host Ruedi Haller to say that we had arrived. Ruedi gave us a pleasant surprise by turning up at the campsite that night to greet us and welcome us to the park! He is exceptionally kind and helpful, a keen outdoorsman and proud to work in the National Park as the head of the Science and Geo-information Department. The next morning, we met with Ruedi at his office in Zernez. The National Park administration building is an old castle, dating from the 12th Century. Dave helping park researches to move the solar panel. Across the road is the modern Tourist Information Centre where Ruedi introduced the park before we went inside to soak in all the information – and there was a lot of information! After that, we were on a fun-filled programme of adventure and discovery that lasted as long as we could keep up for! 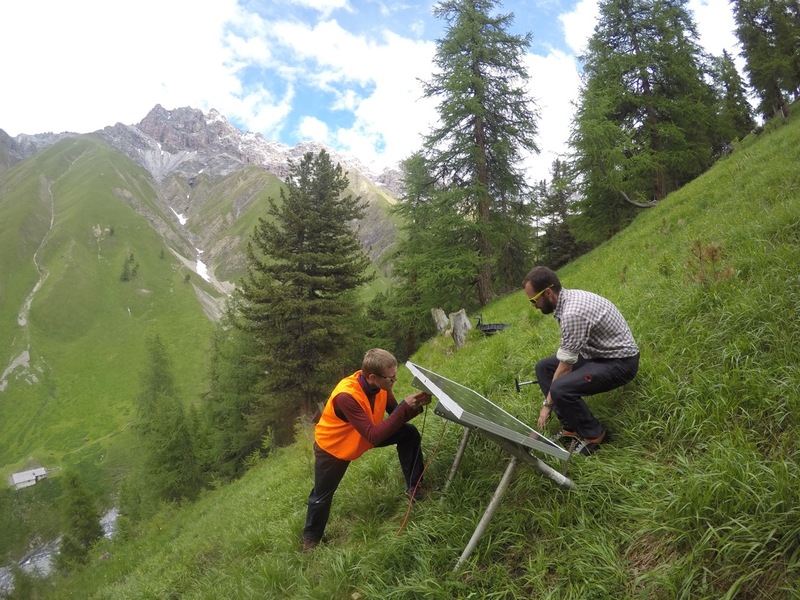 During our stay, together with the researchers we went out to move a solar panel, collected some deer poo, searched for anthills, observed the trial of a camera-drone, went wildlife watching, and did several mountain hikes. Everyone we met there was truly wonderful and the experience we had was just fabulous. By the end, we felt enlightened, educated and exhausted. The Swiss National Park is 101 years old. There are three main principles of the park: to allow the unhindered development of nature without human interference, to research the consequent natural processes and to inform visitors. Natural processes are crucial to the National Park, the only activities allowed in the park are hiking and research – nature is left to her own devices. There are no vehicles allowed, no hunting, no culling, no fishing, no cycling, no tree felling, no planting, no mowing, no livestock grazing and no walking off the trail. It even says on the signs that you are not allowed to make noise – they’re serious about no human intervention! It sounds draconian, but the results speak for themselves. The landscape is beautiful and some of the animals in the park are quite tolerant to people. These strict rules result in amazing opportunities to see shy animals up close. The animals that roam the park include red deer, roe deer, Alpine ibex, chamois and Alpine marmot. The landscape consists mostly of trees (predominantly pine and larch) with some areas of open grassland, rock and scree. The highest peak in the park is just over 3000 m. The grazers and browsers maintain areas of open grassland by eating trees and shrubs faster than they can regrow. We had some discussion with Ruedi about this because I wondered whether it was un-natural to have those areas of open grassland. If there were wolves here, the grazers would not have such free rein and there may be more trees or in different places. However, Ruedi quite rightly sent some questions of his own back. What is natural? Who is to say what a forest should look like? I suppose he is right. Since the glaciers retreated here 10,000 years ago, humans have lived here and if you think of human activity as un-natural, nothing about this landscape can be natural. The Alpine marmot (Marmota marmota) is common in the Swiss Alps between 2500 and 10,000 feet in elevation. 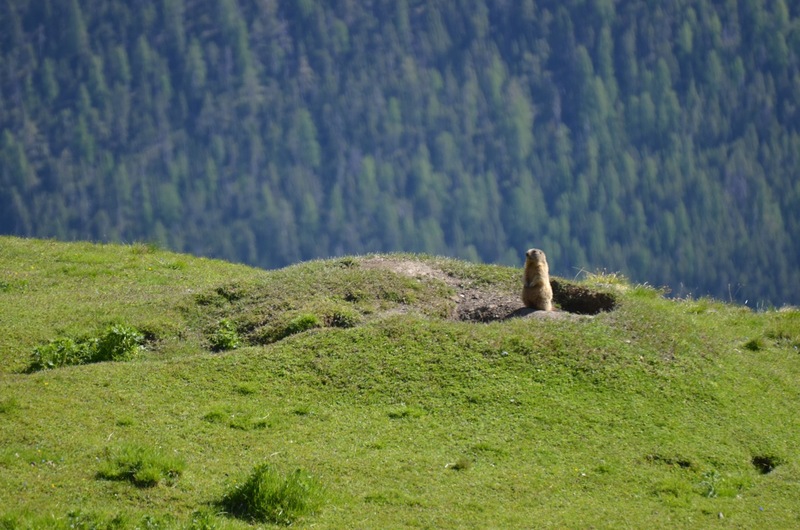 One can often see an Alpine marmot “standing” while they keep a look-out for potential predators (such as golden eagles) or other dangers. 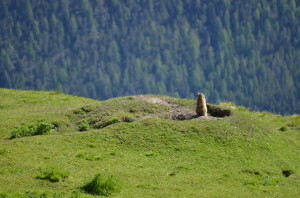 In the Engadin region, which includes the National Park, human impacts are visible in much of the landscape. Those impacts include farming, river dams, river channel alterations, construction of infrastructure and a lot of historic eradications and extinctions. Not all of these impacts have affected the National Park, but the eradications and extinctions certainly have. Recent eradications (from the year 1800 to 1900) in Switzerland include wolf, beaver, red deer, bearded vulture, alpine lynx and brown bear. That is quite a list! However, it is a history shared by many European countries. Red deer returned to Switzerland from a surviving population in Lichtenstein and now roam the National Park in good numbers. Bearded vultures were also reintroduced and the National Park now has several breeding pairs. Wolf, lynx and bear have returned to parts of Switzerland and have all been sighted in the National Park at some point, just as incidental visitors for now. The park welcomes the return of these animals and the changes that result from their return will be allowed to take their course. Although human activity shapes some of the characteristics of the National Park there are clearly greater forces at work. It is visible that the ice carved this landscape and water, rock and snow gave it its shape. During the Ice Age glaciers covered almost all of the land here and the ice reached a height of around 3000m, only the highest peaks escaped its sculpturing. Each peak is called a Piz and each glacier-rounded summit is a Mund. The glaciers also carved u-shaped valleys, left behind moraines and formed lakes. On one hike, we went to see the birthplace of one of the biggest glaciers – the Macun Basin. During the Ice Age, the ice piled up inside the basin and spilled out over one edge to fill the valleys below. The basin (called a cirque) is now pitted with depressions that contain clear water. The lakes are beautiful, and even in June the basin is half-full of snow. But still the wildflowers grow, and some are particularly adapted to this harsh habitat. The pygmy buttercup is only found in one place in Switzerland, and it’s right here in snowy corners of the Macun basin. Ice carved landscape in Swiss National Park. The Ice Age glaciers are long gone, but there are still plenty of natural processes at work. There are mudslides, landslides, rock-falls and avalanches. Outside the park, there are sometimes avalanche protection barriers but inside the park, where nobody is living, nature takes care for itself. These natural events sometimes destroy large forest areas, but these kind of changes are important in this – by nature – dynamic landscape. When an area of forest opens up, wildflowers and berry-laden shrubs can thrive there before the forest canopy closes over once again. There is a wealth of research data on the National Park. Research has been going on here since the park was established,which is over 100 years. Many of the park research projects use historic data in addition to new data. Current initiatives include looking at landscape changes using historic photographs, discerning stress levels in deer, examining the behavior of wood ants in trees using a drone, and many, many others! The Swiss National Park and its people are very special; we had a fabulous visit and are very grateful to our hosts. There is always something exciting going on here and it is sorely tempting to stay! However, the road is the home of the traveler and it is time to move on once again. Follow our progress here: www.forpeoplefornature.com. To find out more about the European Rewilding Network, its members and how you can join click here.